Philip Ross is CEO of Cordless Group and UnWork.com and is an author, commentator and consultant on the future of work. Through Unwork.com, Philip aims to challenge the status quo and look forward to a new world of work. He’s driven by the “six pack” of forces — demographics, culture, technology, sustainability, travel/the city and workplace/property. He believes an opportunity exists for designers to drive innovations as many of the constraints and preconceptions of workplace design begin to disappear. The era of fixed, heavy technology that has tied office workers to their desks is over, and with the move towards mobility and the cloud comes a new paradigm for work and the workplace. People are no longer housed in dumb containers called offices. The workplace becomes a place for people — not equipment, files, and paper. And so it becomes more human and fluid. 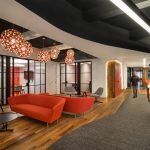 Interesting, innovative space provides not a factory of cubes but an eclectic array of activity-based settings, each with its own function and character. Form follows function in a workspace that is people-centric. Co-creation will become the name of the game, with designers acting as curators of talent, shaping creative spaces that inspire and energize. Philip believes that a new era for design is emerging; one where materials, furniture, finishes and accessories can be bespoke for a boutique workplace. “Craftsmanship becomes important again, as measures of success move from space efficiency and sharing ratios, to wellbeing, happiness, engagement and productivity. As the new world of work permeates organizations, people will begin to respect the individual and design will again reflect tastes and personality and not corporate mediocrity and bland, vanilla efficiency. From Sydney to Utrecht, new workplaces are emerging that embrace these trends, setting the bar for a more eclectic, advanced, and thoughtful set of spaces for the knowledge workers of the 21st Century. Very interesting viewpoints on how the workplace could change over to a “boutique” setup with many different setups vs consistent ones. Do you find that these ideas are most accepted in small companies, enterpreneurial circles, or is there acceptance of this concept in larger corporations? I find that the large institutions still seem to be focused on occupying less space, at less cost, and are looking for consistent application of workstations vs originality and modifying the workplace to the worker. These trends do not seem confined to small or large companies – more to the approach they have to innovation and the desire by leadership to be bold. Most of the exciting case studies come from large businesses, often in financial services, technology or professional services. The idea of co-creation for example was used in Rabobank’s new headquaters.